Cost-efficient product group comprising full-featured tools for fast and easy recovery from single file system. Recovering lost or deleted files from all types of XFS-formatted storages, including storages of Linux desktops, servers and network attached storages (NAS). Files and folders contents identification, fragmentation details etc. through context dependent storage navigation. Accurate detection of current and previous file systems after formatting and targeting recovery process at a certain file system state. Selection of necessary files and building file system tree similar to the original one on the target storage. Extensive software operations with a set of optional external modules (plug-ins). Modular activation with lifetime license and Short- or Long-term support plans. Raise Data Recovery is a group of software applications each specially created for certain file system type as a cost-efficient data recovery solution. Raise Data Recovery for XFS can only access and recover data from XFS file system. Recognition of other file systems is implemented for informational purposes only. XFS file system features quite good support of deleted files recovery. In its work Raise Data Recovery for XFS applies latest data recovery techniques allowing to achieve highest possible data recovery result. 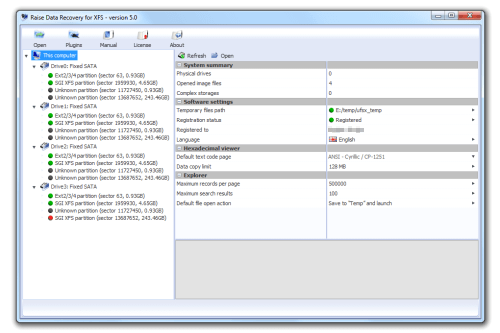 The techniques are heuristics enabling recovery of deleted files even with real file names. Raise Data Recovery for XFS is a cost-efficient solution for data recovery from popular XFS-based NAS. 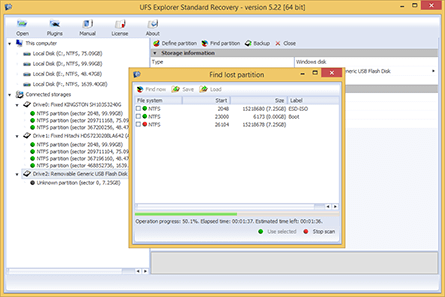 The software works applying the same powerful mechanisms as UFS Explorer Standard Recovery software enabling efficient recovery of accidentally deleted data and data lost due to logical file system damages after formatting hard disk, hardware malfunctions or software failures, virus attacks, blackouts etc. 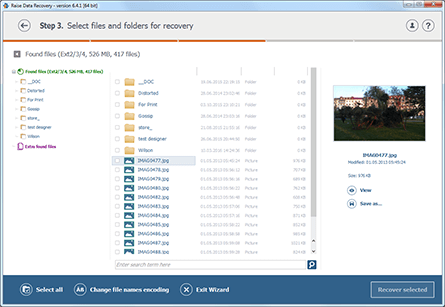 Raise Data Recovery is able to recover data from your PC, USB flash drive, memory card of your photo/video camera, external hard drive, disk images and virtual machines formatted with such file system as well. For enhanced capabilities the software is supplemented with plug-ins for reconstruction and further recovery from complex RAID-systems as well. Despite limitations of data recovery to one file system, the software recognizes other file systems, like Windows (NTFS, FAT); Apple macOS (HFS+); Linux (Ext2, Ext3, Ext4 , Reiser, XFS, JFS (JFS2) and FreeBSD (UFS/UFS2) as well. 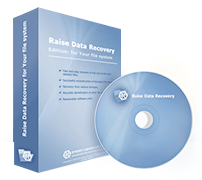 Raise Data Recovery detects file system type and finds lost and deleted data allowing you to define the file system type and select Raise Data Recovery software for your file system. Raise Data Recovery ensures complete safety of your data. The software works in a safe read-only mode and never alters the original information. Moreover, no prior technical skills for working with the programs are needed. The user-friendly interface and ease of use make the application a perfect solution even for non-experienced users. A reasonable price of the software oriented on the file system type saves money, while fast-working powerful software mechanisms save time. The software is adopted to search for lost XFS-formatted file systems and recover lost or deleted files efficiently. The software allows users to access data on all the supported file systems, including file systems stored on disk images, virtual disk, RAID storages etc. without the need of prior scan. The software allows opening disk images and virtual disks produced by virtual machines of leading virtualization software retailers (including VMware Player, VMware Workstation, Microsoft Virtual PC, Microsoft Hyper-V, Parallels Desktop etc.). The application operates virtual disks and disk image files exactly as if they were physical disks and allows users to access or recover lost data from disk images and virtual disks. 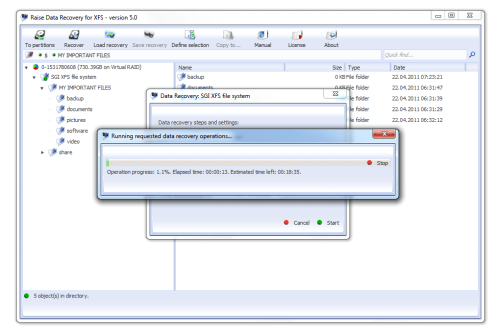 With optional module RAID Access Plugin and RAID Builder the software supports virtual reconstruction of RAID system after failure of controller or RAID metadata. The program virtually builds RAID and reads its files and folders as if it were physical RAID storage. The software easily handles both simple RAID configurations (such as stripe set - RAID level 0, Span, Mirror - RAID level 1) and complex RAID such as RAID 5 and RAID 6. RAID-on-RAID feature allows building RAID configurations of high complexity such as RAID 50, RAID 60 etc. Optional support of Runtime Software Virtual Image Files with RAID Access Plugin - VIM Import allows setting up custom RAID configuration with different data distribution algorithms. The set of tools integrated in the software provides solutions for most practical data loss cases. Depending on situation the software either simply reads or conducts deep analysis of file system metadata to find lost files. Even if the metadata is lost permanently, the program can predict file allocation basing on file system specifics, other files allocations and file content analysis to produce maximally successful data recovery result even in severe data loss cases. AMD64 (x86-64) - all operating systems.